Lead is a toxic heavy metal that affects the lives of millions of people every year. Lead occurs naturally in the Earth’s crust and is mined for use in products such as pigment in paints, dyes and ceramic glazes; caulk; pesticides; ammunition; pipes; weights; cable covers; car batteries; and sheets to protect people from radiation. Lead is often combined with other metals to form alloys, and, until recently, was commonly added to gasoline to increase octane ratings. Environmental levels of lead have been increasing for hundreds of years, and are only just starting to decrease in response to greater awareness of its harmful effects. Today, much of the lead in circulation exists in car batteries, also called used lead-acid batteries (ULAB). Of the six million tons of lead that are used annually, approximately three quarters go into the production of lead-acid batteries. Of these batteries, 97% are eventually recycled to retrieve the lead. The high levels of recycling are, in part, due to the increase in lead prices over the last 15 years. In low- and middle-income countries, common industrial sources of lead pollution include mining, primary and secondary metal smelting, steal and iron production, car battery recycling, and the production of pigments. Lead that is released into the air is brought back to Earth by precipitation or as particulate matter falling to land or surface water. 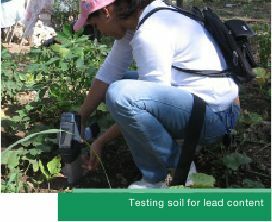 Once lead reaches the top layer of soil, it tends to adsorb to soil particles that can be blown around as dust or be tracked throughout a community by people walking in the impacted area. The lead in the soil can also reach surface water bodies as part of storm water runoff. Water movement through the soil can transport lead to ground water, which is used for drinking water and crop irrigation. Lead often enters the environment through releases during the mining process for lead and other metals, as well as from factories that make, use, or recycle lead or lead compounds. Lead can also be released into the air by burning coal, oil, or lead-containing waste. Once lead is on the ground it can remain in the upper layer of soil for many years. Lead can migrate into ground water supplies, particularly in areas that receive acidic or “soft” rainwater. Furthermore, levels of lead can build up in plants and animals when the surrounding environment is contaminated. The health effects of lead poisoning are both acute and chronic, and are particularly severe in children, the most exposed group. These adverse impacts can include neurological damage, reduced IQ, anemia, muscle and joint pain, loss of memory and concentration, nerve disorders, infertility, increased blood pressure, and chronic headaches. because of their smaller size, even small amounts of lead in the bodies of children can be associated with longterm neurological and cognitive defects. When women who are pregnant are exposed to lead, it can result in damage to the fetus and eventual birth defects. At high concentrations, lead poisoning can cause seizures and death. plates, which begin to deteriorate. Over the course of multiple recharges, the unit can no longer properly store energy for a prolonged period. However, because of variation in the unit’s production and operating conditions, there is no set number of recharges one battery can take before its use is compromised. Once units cease to be effective, they are often sent to a ULAB recycler. Several factors have heightened the risks posed by ULAB recycling. One factor that compounds ULAB risks is the increase in population density in urban centers in low- and middle-income countries where informal recycling takes place. In addition, the cumulative effect of high unemployment rates and increased car ownership has lead to the proliferation of informal ULAB recycling. Currently, ULAB recycling occurs in almost every city in low- and middle-income countries. In addition to being located in these densely populated urban regions, ULAB recycling and smelting operations are often performed with few environmental safety controls and with little understanding of the risks involved. According to the Basel Convention on the Control of Transboundary Movements of Hazardous Wastes and Their Disposal—an international treaty designed to reduce the movement of hazardous wastes to low- and middle-income countries—ULABs are a dangerous source of pollution. When the recycling operation is informal and small-scale, recyclers often break batteries open by hand or with an axe. In many cases, informal battery recycling is a subsistence activity undertaken in homes and backyards. Because global demand for lead is high, ULAB recycling is an economically valuable activity and a large source of recycled lead. This high level of recycling effectively reduces the volume of lead dumped into landfills and minimizes the need to mine lead ore, but it also leads to dangerous conditions around recycling facilities. The lack of education about health risks, combined with a lack of resources, leads to dangerous working conditions at ULAB recycling facilities and severe health risks to local populations. Blacksmith Institute is implementing cost-effective remediation projects at ULAB recycling sites in the Dominican Republic, Senegal, Jakarta, Manila, and other locations around the world. The efforts focus on eliminating exposure to lead from informal ULAB recycling through several steps. These steps include: monitoring lead levels in blood (primarily in children); partnering with local governments, NGOs, and community leaders to conduct education programs about the dangers of lead poisoning and ULAB recycling; excavating contaminated soil and removing toxic soil and dust in and around homes; and either formalizing the recycling process or providing other sources of income for those who previously have depended on this activity. : H. Roberts. “Changing Patterns in Global Lead Supply and Demand.” Journal of Power Sources 116.1-2, (2003): 23–31. : U.S. Department of Health and Human Services. “Toxicological Profile for Lead.” Georgia: Agency for Toxic Substances and Disease Registry, 2007. B. Kaul and H. Mukerjee. “Elevated Blood Lead and Erythrocyte Protoporphyrin Levels of Children near a Battery-Recycling Plant in Haina, Dominican Republic.” International Journal of Occupational and Environmental Health 5.4, 1999. United Nations Environment Programme. 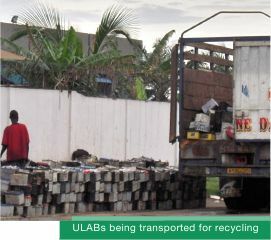 “New Basel Guidelines to Improve Recycling of Old Batteries.” Available at http://www.unep.org/Documents. Multilingual/Default.asp?DocumentID=248&ArticleID=3069&l=en, May 22, 2002. B. Kaul, et al. “Follow-up Screening of Lead-Poisoned Children near an Auto Battery Recycling Plant, Haina, Dominican Republic.” Environmental Health Perspectives 107.11 (1999): 917–920. P. Haefliger, et al. “Mass Lead Intoxication from Informal Used Lead-Acid Battery Recycling in Dakar, Senegal.” Environmental Health Perspectives 117.10 (2009): 1535–1540. Department of the Environment and Heritage. “Used Lead Acid Batteries: Factsheet.” Australian Government. Available at http://www.environment.gov.au/settlements/chemicals/hazardous-waste/publications/lead-acid-fs.html, August 2005. H. Roberts. “Changing Patterns in Global Lead Supply and Demand.” Journal of Power Sources 116.1-2, (2003): 23–31. Trade and Environment. “A Teaching Case: The Basel Ban And Batteries.” Available at http://www.commercialdiplomacy.org/case_study/case_batteries.htm, 2002. Basel Convention. United Nations Environmental Programme. 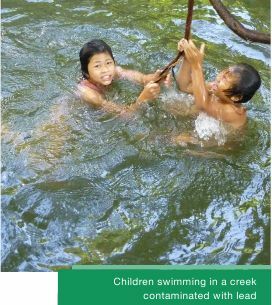 “The Basel Convention at a Glance.” Available at http://www.basel.int/convention/bc_glance.pdf, 2005. D.A. Khan, et al. “Lead Exposure and its Adverse Health Effects among Occupational Worker’s Children.” Toxicology and Industrial Health, 2010. T.I. Mohammed, I. Chang-Yen, and I. Bekele. “Lead Pollution in East Trinidad Resulting from Lead Recycling and Smelting Activities.” Environmental Geochemistry and Health 18.3 (1996): 123–128.